At the moment there seem to be some really super palettes in my daily makeup routine, so I thought I would dedicate a post to my favourite palettes of the moment! Some are cult favourites, such as the Naked 3 palette, some are luxurious and high end products – the Hourglass Ambient Lighting powder, and some are budget buys that I turn to over the more pricey options, such as the Seventeen Instant Glow Cream Bronzer and the Sleek Blush by 3 Trio! First i’m not going to go into too much detail about the Naked 3 palette or the Naked Flushed, as I’ve reviewed them both previousl (Naked 3 review here, and Naked Flushed review here!) But as far as eyeshaddow palettes go, I’m yet to find one that I prefer to Naked 3 – the rose-hued shades seem to be exactly what I need for day looks, no-makeup-makeup days, as well as evening glamour! The flushed palette as well is just so handy, with the bronzer, blush and highlighter in one – it is the ultimate handbag space saver! Two products which are kind of similar, ish, yet I still feel the need to use both of them on a daily basis, are the Hourglass Ambient Lighting Powder, and the Clarins Opalescence Face & Blush powder. You can’t really see from my pic but the Clarins powder comes in the most stunning, iridescent palette and has a handy mirror in the lid. It was part of their Spring 2014 collection, and it’s a beautiful 3 in one product which I use mostly as a foundation setter by swirling a large brush over the whole palette. The harmony of colours within the palette give a warm, healthy complexion with a matte finish. Then, to add some subtle everyday highlighting I always reach for my Hourglass Ambient Lighting Powder. Now this product is a beauty bloggers favourite and I have a confession – I purchased this ages ago when the first round of hype was circulating the beauty blogs, I photographed it, and completely forgot to publish the post! Doh! I have the shade Radiant Light, and the end result, it’s hard to explain, but it’s as though you’re skin has been photographed in soft light, giving a diffused warm glow. It minimises the look of imperfections and blurs pores and is a translucent powder with shimmering flecks that add radiance where applied. The texture of the Ambient Light Powder is quite incredible – it is so finely milled and in the palette has a silky appearance and texture, and it blends out super smoothly. Finally are the two budget beauty products which I am absolutely loving at the moment – the Sleek Blush by 3 trio palette, and the Seventeen Instant Glow Cream Bronzer. The Sleek palette is an absolute space and money saver! At just £9.99 it works out at just over £3 for each shade, and they are almost the same size as ONE Nars blush – which of course is almost 8x the price! The formulas are really buildable and I find the powder texture really easy to work with. I find these three shades are all I really need, depending on the look I’m going for that day! I sometimes mix them together, using the deeper shade for contouring, and the peachy more shimmery shade to highlight. Seventeen as a whole have seriously upped their game recently, and i’m reaching for so many of their products over more expensive versions recently (i’ll be doing a whole budget beauty post soon!) but my stand-out favourite has to be the Instant Glow Cream Bronzer. I’d never tried a cream bronzer before this and it took me a while before I used it, as I thought the consistency would dislodge my foundation, but I was surprised to find it really easy to use. It’s really great for building up a stronger colour, so I’m still using it now that I have a bit of a tan from holiday. I apply it using my Real Techniques Beauty blender brush, and then the RT contour brush when I want to add a little more definition. There are plenty of other palettes that I reach for frequently, including the Sleek Contour Kit, but I’m planning a Budget Vs Blowout comparison post for that one – so stay tuned! 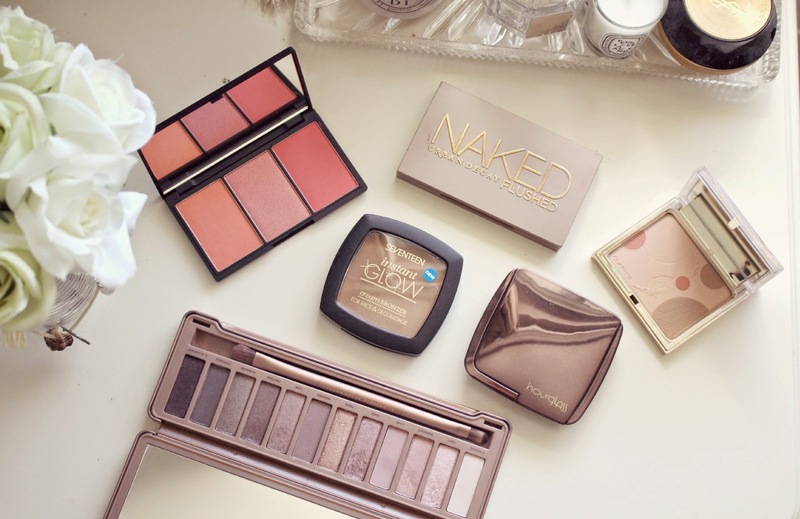 Do you use any of these palettes?